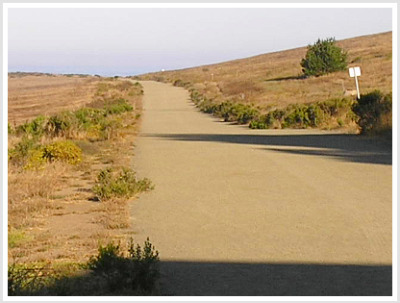 Hiking Trails Cambria - Hiking in the Cambria area is popular for most locals. The Fiscaline Ranch or "East/West Ranch" as locals call the preserve is one of our favorite hiking spots. The Ranch is called the East/West Ranch because it is divided into two separate passive recreational areas. The West side is our favorite side of the perserve. The Bluff Trail runs along the ocean and you can climb down in a few places and take a close look at tide pools and Sea Otters. This trail has a board walk, at least part of the way, and it is easy to walk and has a wonderful view of the Ranch and Sea. The Marine Terrace trail is located between the north end of Windsor Boulevard and runs into Marlborough Drive on the south side. This trail is super dog friendly. You can take the dogs off the leash and let them run. Out of the many hiking trails Cambria this is the trail we walk on a regular basis because our dogs love to run. The East side of the Fiscaline Ranch Preserve starts off of Main Street next to the Bluebird Motel. There is a little bridge you cross and away you go. The Nottingham Bluff trail is another and one of many hiking trails Cambria. This trail is located on the high bluffs on the ranch. It is a great hike and provides great views and places to rest along the way. This hiking trail is located off of Windsor on Nottingham Drive. 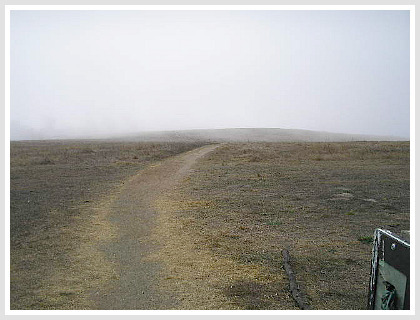 The picture below was taken while the marine layer was thick. Remember to take a jacket, you might need one because the marine layers moves in and out. It seems to have a mind of its own. We want your stay in Cambria and the Central Coast to be the most fun you have ever experienced. For a complete list of all the hiking trails in the San Luis Obispo Region of the Central Coast of California Click Here-Hiking Trails Cambria.